Cornwall’s digital tech sector has been singled out as one of the fastest growing in the country in the latest Tech Nation 2017 report. According to the report from Tech City UK, Cornwall’s digital businesses grew their turnover by 51% between 2011 and 2015, and the sector spawned an average of 22 start-up tech businesses every year in the same period. 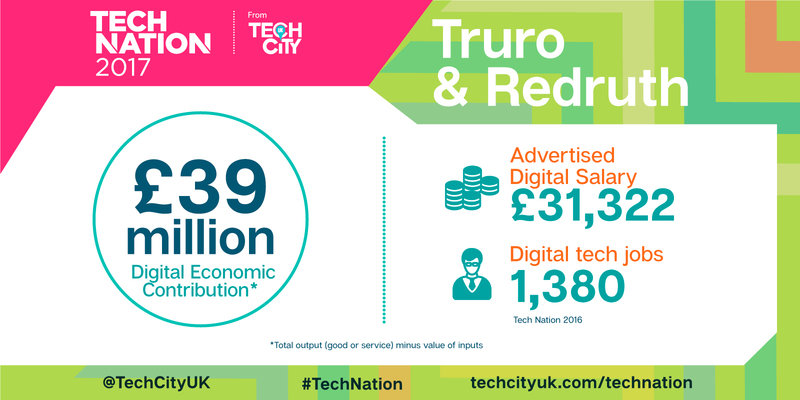 Cornwall-based tech businesses that responded to Tech Nation’s latest survey employ 1,380 people and the average advertised salary for digital tech jobs is £31,322 compared to a Cornwall-wide average of £17,873. The report adds that investment in superfast broadband means Truro now has more fibre connections than most European cities, while the sector is backed by a collaborative ‘ecosystem’ that includes industry group Software Cornwall, the Digital Peninsula Network with 700 members in Cornwall, and the annual Agile on the Beach conference that has become a highlight of the digital tech scene. Redruth-based Bluefruit Software director and Cornwall and Isles of Scilly Local Enterprise Partnership Board member, Paul Massey, said: “The digital tech sector is worth around £39 million a year to our economy and is one of the fastest growing thanks to continued investment in broadband, business support and skills development. Massey added that despite an ongoing skills shortage, the industry in Cornwall was starting to create its own solutions. Read what the Tech Nation 2017 report has to say about Cornwall’s digital tech sector here.